There are some things that you can always count on. The sun will rise in the morning and set at night. Clean sheets feel wonderful when you first climb into bed. You will cry at Hallmark movies. 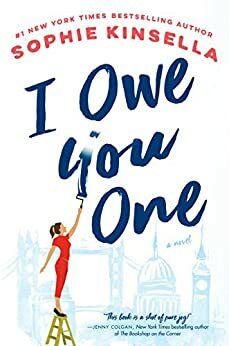 And, you will never not be entertained by a Sophie Kinsella book. She is pure escapism in it’s best form. I actually was reading this while that “exciting” game was on yesterday and it made time go by somewhat quicker. Fixie Farr fixes things. She can’t help herself. It makes her nervous when something is not in it’s right place. Her family and the family store are a huge mess right now. Her mother, who runs the store, is off to Spain with her sister after medical issues. Her brother, quite the big shot, is trying to turn the store into something it’s not. Her sister is a space case. Her childhood crush Ryan is back in town and those feelings are stirred up, even if he is a douchebag. But things really start to get going when she saves a laptop for a guy in a coffee shop. Sebastian “Seb” tells her that he owes her one because all his work was on there. He writes on IOU on the coffee sleeve. This IOU goes back and forth throughout the story. As any good Sophie Kinsella book goes, you will want to reach in the page and shake up a few people. Not that her writing makes you violent and even though you know there will be an inevitable happy ending (and what is wrong with that?! ), there are those characters that deserve it! Fixie being one of them at times. Her heart is always in the right place but her actions might not be. She is a great character to root for and you will. I loved her interaction with Seb. It really brought me back to reading the Shopaholic series. If you are looking for something to just read and enjoy and not worry about the heaviness of it all, pick this one up. I am all for happy endings and Sophie Kinsella. Thanks to Netgalley and Random House for a copy of this delightful book.